Mel helps Christina out with the accounts. Christina is very grateful and sits in awe watching. Mel admits that she misses it, but is enjoying her new job, and will stick with it if the pay works out. 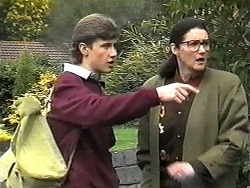 Joe arrives back, but Mel tells him Madge called, with regards to Toby, so he heads back out to fetch him. Christina heads off just as Matt arrives back with their pay. Matt did okay, and is pleased with the money he's earnt, though Mel didn't earn quite as much as she was expecting. Matt encourages her that with a bit of a change in her technique, she could start earning as much as she did working for Paul. Dot is fascinated to read about Pavlov's experiment in a book, about how dogs salivate when you bring them food. She goes on to read that rewarding a dog can encourage it even more, so decides she needs to change tactics with Bouncer. 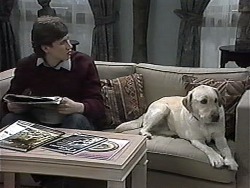 Toby admits to his dad that he was worried he wasn't going to come home. Laughing, Joe reassures his son that he's going to be sticking around for a long while yet; he's not planning on going anywhere. Mel pops over and arranges with Chrissie to meet her for a drink after work at the Waterhole. Caroline appears and disappears out to work within the space of thirty seconds, off to a breakfast meeting. Paul too appears, wondering why Mel is about. She plays up her new job, claiming it's great. Paul too is impressed at how well Christina has been picking up the work, and thinks it's great they've all found something they are good at. The two ladies look at each other not sure what to say. Dot comes over to see Joe. She proposes that she takes Bouncer out tonight to try and re-train him, to prevent him from digging up any more items. Joe doesn't seem too bothered by it, and agrees to let Dot try out her new idea. As Joe heads out to work, Mel agrees to look after Toby for him after school, but Joe admits he wants to spend as much time with his son as possible. He still hasn't worked out how he's going to tell him about the custody case, but Mel reassures him that they'll all be around to help and support him. Chrissie rings Mel, asking for more help with the figures. Hanging up the phone, Chrissie thanks Mel. Paul comes through and gives Chrissie some more work. Caroline isn't sure she got it all, but Chrissie assures her sister that she's fine. Back in the office, Caroline asks Paul if it's necessary to give Chrissie so much work. Paul reveals it's just part of his plan to try and get Mel back. He makes a bet with Caroline that Mel will soon be back trying to regain her old job. Dot comes over to collect Bouncer, though it seems Bouncer may be the one in charge as they head out the door. Joe apologises to Toby about the limited time they've spent together recently, and reveals that it's because Sky may end up living with her real father. Toby seems to understand his father, and agrees to help him in whatever way he can. Dot is out trying to train Bouncer, but it's not going to well. Ryan wanders past and spots Bouncer starting to dig. 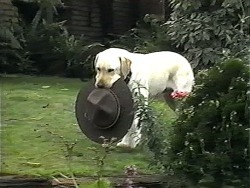 Dot tries to stop him, but Bouncer isn't listening and heads off, returning with Harold's scout hat. Matt finds Mel staring into space. It seems she hasn't had the best day, between answering the phone for Joe, receiving calls for help from Christina, and having one of her clients nearly die on the other end of the phone. Matt asks what she plans to do. She's going to go and crawl over to Paul's office and ask for her old job back. Dot has managed to persuade Bouncer to return a paintbrush to the toolkit, and feels she has succeeded. Matt wonders how long it is going to last. Dot informs him that now he is trained, he shall always behave. Heading off, Dot is soon followed by Bouncer, once again proving her wrong. 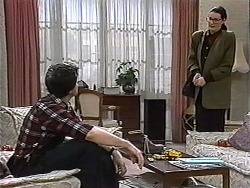 Chrissie is busy having an argument with the type-writer, when Jim arrives. As Caroline heads off for the evening, she gives Chrissie another letter to go out in the post that night. Chrissie realises she probably won't manage to meet Mel at the pub after all. 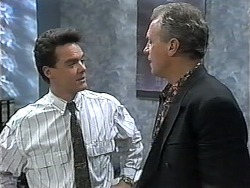 In the office, Jim asks Paul if he'd like to join him for a drink at the Waterhole. Paul suggests they make a night of it and go onto a club afterwards, joined by some ladies from his 'little black book'. Jim politely declines on the ladies idea and agrees to meet him at the pub. Eric knocks at the door, asking Joe if they can arrange some access time. Joe declines, and points out that he was willing for Sky to be adopted, so why has it all changed. 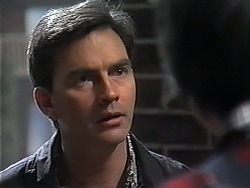 Eric points out that that was before Kerry died, and since then, he can offer Sky a more stable home. Joe points out that he is no father of Sky's; in three years they haven't heard anything from him, not even a birthday card. Eric argues that with Kerry gone, it will be hard enough raising his son by himself, but Joe doesn't see it that way, he has both a son and daughter. JOE: We are a family, and nobody, nobody is going to split us up. Dot is still failing at persuading Bouncer to leave. Ryan persuades her to just accept that Bouncer simply loves her. Chrissie is still working hard as Paul heads off. However he is met by Mel coming through the door. She starts to say something, but instead asks Chrissie how things are going. Paul sings Chrissie's praises and points out to Mel, that since she doesn't want her old job back, he's going to offer it to Chrissie. Chrissie is thrilled and accepts.